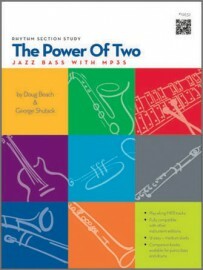 Description: As a supplement to the previously published jazz duet books, The Power Of Two, these rhythm section books can be used individually or together in conjunction with the duet books to create 12 charts for jazz combo. The pieces include a variety of styles, tempos and harmonic progressions. Three downloadable MP3’s are included for each piece; a full performance, only the rhythm section parts, and finally a track that features both duet and rhythm section minus your part.